How do I make this work...should I call yarn shops...should I e-mail them....send a brochure...what someone tell me what to do. I sold bunches of patterns at TNNA and am now scattered across the US!!! Thing is, I realized in the end I sold to only 14 shops. I couldn't get to people fast enough and once the Brown Sheep trunk show of my bags booked up until August 09 that was both wonderful and awful. So, now I am offering a trunk show directly from me! I think i will e-mail people a brochure....or snail mail. Hmmmmm. 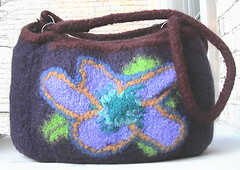 There's a new girl in town and her name is PHOEBE- she is a medium sized bag created with bulky weight yarn single strand, most of bag is worked in the round, exterior pocket has an intarsia flower...don't be skird, try it...the pocket is added at the end and it very achievable in that it is 32 rows of 30 stitches...feeling inspired? Go to my on-line shop for more details on the pattern or complete kit. You know, even though Gerri doesn't sell brown sheep she talked about buying some of your patterns...or at least wanted to do that. Maybe...she would be interested in the trunk show! Also, when are you coming back out here? There is a very special person (Robyn Chachula) who is going to be here on Sep. 25th and I wondered if you would be around too. Maybe we all could have a slumber party at "Becky's" house? I don't know if this is the appropriate area to leave comments (for someone who claims not to know how to advertise herslef, you sure have lots of blogs! ), but I just wanted to take the time to tell you that yours if the first (and so far only) podcast I've ever listened to. I haven't gotten up to date yet (currently listening to episode 29, which was recorded in early December of last year), but I wanted to tell you how much I've enjoyed listening to your program. Yours will be the podcast that I'll measure all future programs up against!